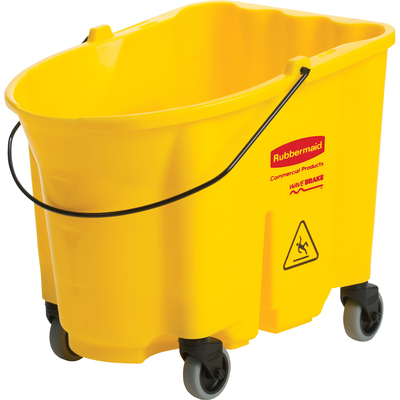 This Bucket Is Part Of The Rubbermaid Wavebrake Mop Bucket And Wringer System That Reduces Splashing For A Safer Environment, Cleaner Floors And Improved Productivity. High Capacity Is Made For The Largest Commercial Cleaning Jobs. Bucket Is Made Of Premium Tubular Steel And Structural Web Molded Plastic. Foot-Pedal Water Evacuation Is Conveniently Located, With No Lifting Required, For Worker Well-Being. Dirty Water Bucket Is Sold Separately.. This Bucket Is Part Of The Rubbermaid Wavebrake Mop Bucket And Wringer System That Reduces Splashing For A Safer Environment, Cleaner Floors And Improved Productivity. High Capacity Is Made For The Largest Commercial Cleaning Jobs. Bucket Is Made Of Premium Tubular Steel And Structural Web Molded Plastic. Foot-Pedal Water Evacuation Is Conveniently Located, With No Lifting Required, For Worker Well-Being. Dirty Water Bucket Is Sold Separately.